“Bourbon Bacon Molasses Apple Pie”. Until today, nothing would come up in a search engine with those five beautiful words strung together. Now, this is not a healthy pie. Nor a medicinal pie, except in that it may have magical qualities when trying to lure lovers or tame unruly children. It blends those delirious tongue-teasers of savory and sweet, the unsuspected crunch of candied bacon embedded in folds of apples both sweet and tart. A blend of spicy and soothing cinnamon and a dash of fresh nutmeg fuse them together and they sleep contented in a flaky, free-0f-the-demon-gluten crust. This pie is work, but so worth it. In making this recipe I combined techniques I’d learned from other kitchen explorations – par-baking apples, candying bacon, blending healthy flours for a gluten-free crust – and am very pleased with the first incarnation. But this recipe still has further to go; it’s delicious on day one but the bacon sags into an unappetizing texture if you keep eating it on successive days (but if it’s more than you and a roommate trying to wipe it out of existence and you can eat it in one go, bake on). The bourbon gives a delightfully oak-y slight to the senses, but hasn’t packed a wallop yet. If you’re looking for a comforting, complex apple pie recipe with a twist, check this recipe out. It’s fuller-bodied than your traditional American pie, and the flavors round themselves out very well. This recipe requires three steps: 1. Candying bacon. 2. Preparing your apples. 3. Preparing and filling crust. Refer to my BAKING BASICS posts for recipes on both filling and a variety of pie crusts. Unbaked pie crust, enough for bottom and top. Lay a baking rack over a cookie sheet with high rims and spray the rack with non-stick cooking spray. Heat small saucepan over medium/low heat. Once hot, pour in 2 tablespoons bourbon and heat until it just gets bubbly. Add 2 tablespoons molasses and stir with spatula until the mixture starts to bubble and expand. Add 1/2 cup light brown sugar, mixing in, and bring to heat until the mixture expands again. 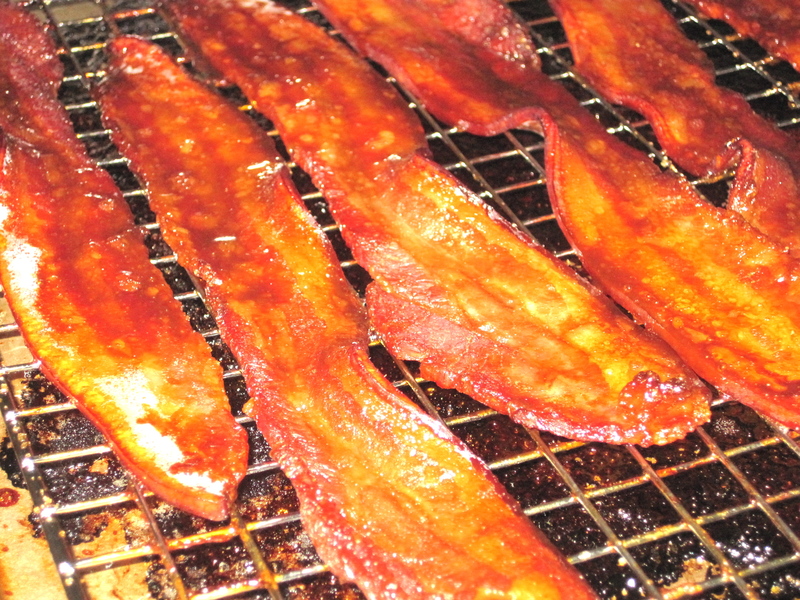 Prepare to get sticky: using your hands, rub each piece of bacon in the bourbon mixture until coated. By the 3rd or 4th piece the sugar mixture will be cooling and drying out a bit – don’t worry! Just drudge it as much as you can to coat the bacon. Coat entirely with extra brown sugar until completely covered. Lay on sprayed rack and bake in preheated oven for approximately 30 minutes, or until bacon is crispy. Set aside and cool completely. 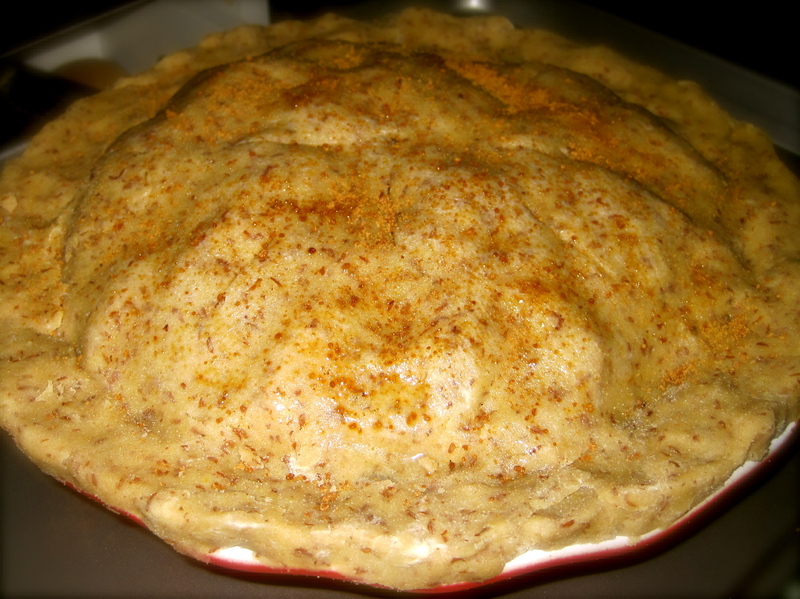 For this recipe, I used 2 kinds of cinnamon, 1 very spicy and one mild and sweet. I love cinnamon, so I used 2 tsps. of each. Vary this to your tastes. Sprinkle on each trap 1/4 tsp of ground cloves and 1 tablespoon sugar, preferably something light like palm sugar over regular white sugar. 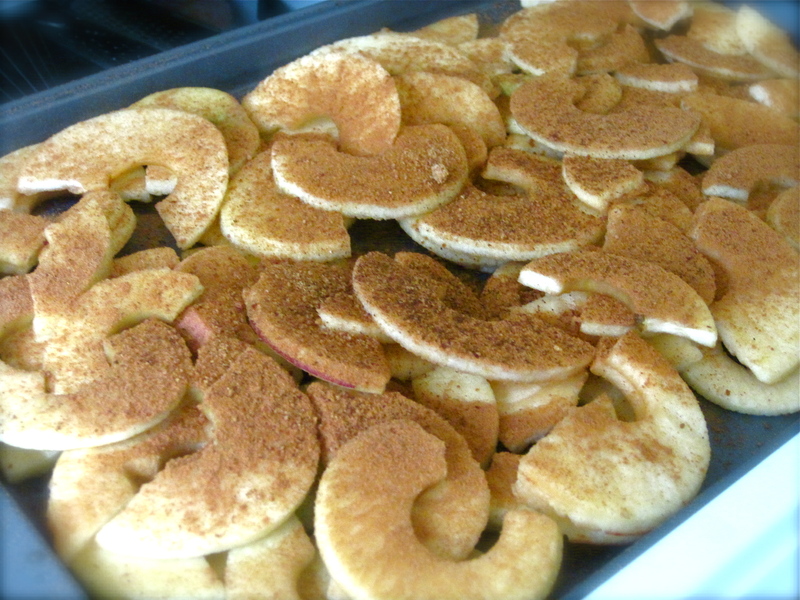 Bake in the oven for 10-15 minutes or until the apples are slightly softened. Use a deep-dish 9″ pie plate (my favorite pie dish is my Emile Henry 9″. It’s wonderfully deep and the ceramic bakes to perfection) and fill it with your bottom crust. Layer the apples in and pack them tightly – the apple should be piled into a very hefty dome. In a small dish, combine remaining tablespoon bourbon and molasses, and drizzle completely over the top of the apples. Place second crust on top, and pinch to close. Bake at 350 degrees for approximately 45 minutes, covering the edges halfway through baking so they don’t burn. This pie is best eaten the same day it’s made, but should be cooled completely before cutting if using a gluten-free crust (they crumble very easily).